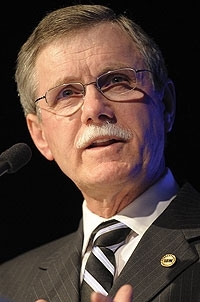 DETROIT -- Ron Gettelfinger, whose UAW is poised to become the majority shareholder of a reorganized Chrysler LLC, says the union has no interest in being a long-term owner of auto company stock. Speaking at a press conference late Monday, the UAW president said the unions Voluntary Employee Beneficiary Association is likely to sell its majority stake in Chrysler to fund retiree health care if the stock appreciates within a couple of years. As soon as the VEBAs in a position to sell stock, we will sell stock to keep the VEBA going, Gettelfinger said. Under the Obama administrations recovery plan for the automaker, the UAW will receive Chrysler stock in exchange for forgoing cash payments originally required for the VEBA. The UAW would get a 55 percent stake in Chrysler and partner Fiat S.p.A. would take an initial 20 percent. The U.S. Treasury would own 8 percent and Canadian governments 2 percent. The union's shares would be nonvoting. Gettelfinger said he believed a Chrysler bankruptcy could be averted until late on Wednesday, April 29, when he received a phone call saying that negotiations with creditors were breaking down. Chrysler filed for Chapter 11 bankruptcy the next day. Chrysler plans to complete an alliance with Fiat during a court-supervised reorganization. Gettelfinger said he is optimistic that Chrysler can move quickly through a managed bankruptcy and forge a successful partnership. Gettelfinger also said that the UAW has met with Fiat CEO Sergio Marchionne several times and is beginning to build a relationship with him. UAW leaders will meet with Italian union leaders and tour Fiat plants, he said.